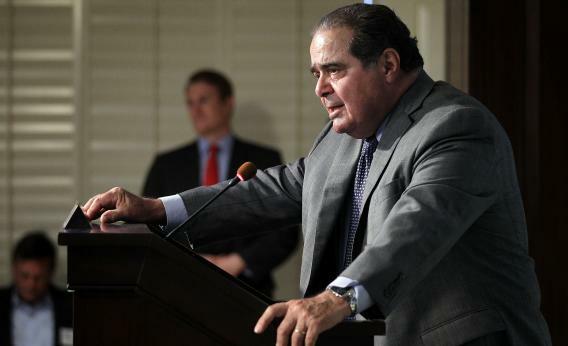 Myriad DNA-patenting Supreme Court case: Scalia says he doesn’t get the science. Today, the court ruled unanimously that natural genes cannot be patented—a decision that will likely help breast and ovarian cancer patients as well as cancer researchers (and biotechnology firms). Behind that unanimity, however, lay a small crack: Scalia, as is his wont, concurred only in part, adding a brief but telling qualification to his vote. Scalia, in other words, doesn’t really understand the scientific basis of the case. And—unlike, implicitly, some of the other justices—he’s not going to pretend to. Basically, Thomas gets the science right. But it isn’t pretty. The Thomas family has a history of struggling with science—his wife once conducted a fawning interview with a notorious climate-change denier—and the explanation of the human genome that he provides is so dense as to be nearly opaque. It seems unlikely, moreover, that the other justices had mastered the science any better. During arguments, Elena Kagan’s keenest insight was that “chromosomes are very useful.” And Samuel Alito teased out a wandering, Breyer-esque hypothetical about a tree branch that, after being “manipulated by the waves” for “many millions of years,” is “washed up on the shore—and what do you know, it’s a baseball bat!” Yet both joined Thomas’ opinion in full and without comment. Scalia will have none of that. He remained relatively quiet during arguments, and it’s obvious that he hasn’t spent the interim eagerly studying the scientific record. His concurrence is a remarkable admission of bafflement by a justice who usually exudes confidence. Rather than take cover behind Thomas’ blurry biochemistry, Scalia simply throws his support behind the important bit—DNA can’t be patented—and ignores the rest. Good for him. Some might be tempted to see Scalia’s disclaimer as part of a broader, deeply worrisome trend of American scientific illiteracy. It’s not. The Supreme Court isn’t the Science Bar, and we shouldn’t expect it to be. So long as the justices grasp the fundamental questions involved, they can work out the fundamental truths. In this case, the court sided with the vast majority of scientists and cancer researchers, which certainly isn’t always the case. In deciding his vote, Scalia’s scientific “knowledge” and “beliefs” played no role, only his basic understanding of the legal disputes. That’s all he needed to vote the right way. We shouldn’t criticize him for disregarding his own (probably tenuous) grasp of the science, as many no doubt will. We should applaud him. And considering some of his other “beliefs,” maybe we should wish he ignored them more often.